Biltong and nut hamper including a biltong knife with a chunk of biltong, salted peanuts and peri peri peanuts presented in a gift box. A gift box containing proudly South African beef biltong, a stainless steel biltong knife, salted peanuts and peri peri peanuts. A great gift for a colleague as a Thank you or Birthday gift, and for dad or granddad on Fathers Day! 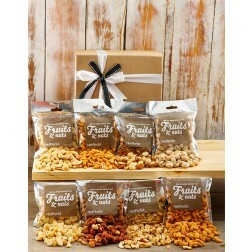 This Biltong and Nut Hamper is available for next day delivery throughout South Africa.